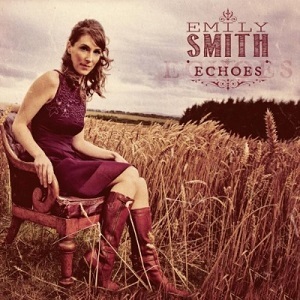 Scottish folk singer Emily Smith recently celebrated ten years as a singer with the compilation album "Ten years". Now it's time for her fifth solo album, "Echoes". For this album she's chosen a selection of traditional songs to record rather than writing new material. With Echoes, she expands the core group of musicians with whom she’s previously played by adding a number of guests. Joining multi-instrumentalists Jamie McClennan and Matheu Watson, bassist Ross Hamilton and percussionist Signy Jakobsdottir are Jerry Douglas, Aoife O'Donovan, Kris Drever, Tim Edey, Natalie Haas and Rory Butler. Listening to the album, this really is beautiful stuff. Emily's voice is fantastic with a lovely sound and nice clear vocals. The music is perfect too - balanced just nicely so that it adds a lot of richness and melody to the songs but without losing the simplicity of the songs or overpowering the vocals. There's a strong Scottish flavour throughout, which you'd expect from a singer with such as strong Scottish identity as Emily Smith. Excellent Scottish Folk Music that's definitely worth a listen.